Today we’re celebrating a very special birthday – a 110th birthday, that is! 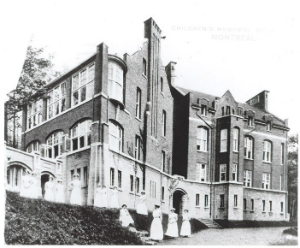 The Montreal Children's Hospital first opened its doors on January 30, 1904 and was the first pediatric hospital in Quebec. Known as the Children’s Memorial Hospital at the time, it was actually located on Guy Street in Montreal. It was a bilingual institution with the sole mandate of caring for sick children. Were you ever cared for at the Children’s? Help us celebrate an exciting milestone by sharing your experience with us. Send us an email: info@thechildren.com.